Abraham Lincoln Brigade volunteer Hy Wallach. Photo courtesy of Nancy Wallach. The words and deeds of the Lincoln Vets still Speak to a generation of present-day Spaniards. 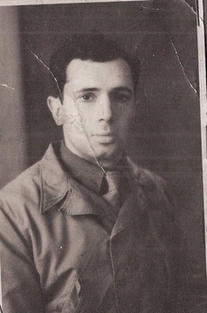 I received an email during the last week of August from Nacho Garcia, a young Spaniard from Burgos who maintains a blog, The Jaily News, named after the underground newspaper written by the International Brigade prisoners who were captured and interned by Franco at San Pedro de Cardeña, Burgos. Nacho was one of the Tribute Committee from Burgos that organized an exhibition and dedication of a monument to the Brigades on the site of the former prison last November. The email contained this photocopy, a record of the interrogation of my father, Hy Wallach, by the fascists when he was captured on April 21, 1938. Nacho traveled from the Basque country, where he lives, to North Western Ferrol, in Galicia, to examine the military files, which are kept there. He transcribed the record of the interrogation, and then translated it into English for me. Nacho commented that the statement was very brief, and “bold and brave.” When asked why he came to Spain, my father answered to fight fascism. When asked if he had any regrets about fighting for the Republic, he answered that he had been well treated in the Republican army, and that his only regret was that since his capture he was no longer able to fight against the fascists on the Aragón front. At great personal risk, he resisted the pressure to give the fascists any information or to make a statement that might be used for fascist propaganda. At that time, the fascists were making claims that the International Brigades had come to work, and that they regretted their decisions to come and be “used” by the Republicans. Upon receiving the email I was struck by the dedicated efforts of this Spaniard in recovering the history of the International Brigades, particularly as it pertains to the history of San Pedro de Cardeña, in Burgos, where he grew up. He has also traveled to Salamanca, where he has copied records of correspondence between the Gestapo and the comandante of the concentration camp at San Pedro and records of the departing Lincoln prisoners signing over their Red Cross privileges to the remaining prisoners of other nationalities. While my father died in 1986, I am glad his words from so long ago are still alive to speak to a new generation. Thanks to the movement for the recuperation of memory, the example the Lincolns and the International Brigades set in battle as well as in captivity is being reclaimed. Wow! Nacho Garcia’s dedication to uncovering more information on the International Brigade is amazing. He truly understands the important of preserving the memory of these people who fought so valiantly. Nacho Garcia’s efforts were instrumental in maintaining the history of the men who fought for the Lincoln Brigade and other International Brigades. His efforts helped maintain and preserve their legacy. Dear Nancy, many people in Spain are still proud of the Lincoln Battalion. It´s only a drop in a sea, however plenty of emotive and brave statements. We Never could compensate them all their efforts as suffering. They are Heros for us. Some of us never ever forget them. The governs were blinded and they were our light from outside. We fighted alone whit our brothers of the international Brigades. We lost the battles and the war, but the spanish Republica and the IB stands in the memory of humankind.